We warm up in the wintertime with a traditional Scottish soup. 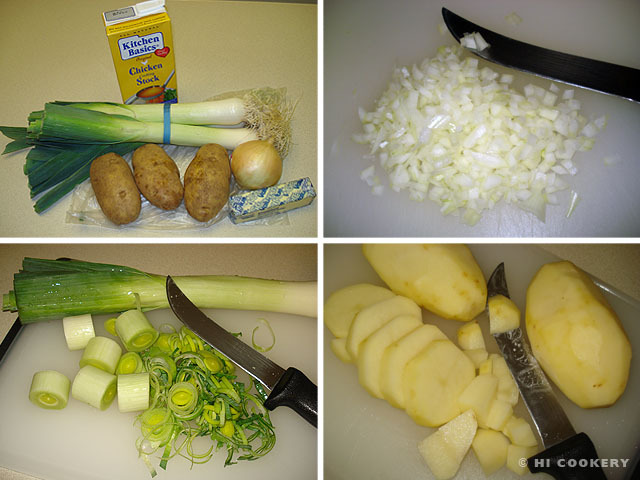 Leeks and tatties (potatoes) are cheap and chunky to make a filling first course. Though this soup is simple, it is served at even the finest Burns Suppers. This is when the Scots get together on January 25 to celebrate the birthday and life of their national poet Robert Burns (1759-1796). Traditional Scottish food is served, such as soup, haggis, oatcakes, whisky and dessert. Guests enjoy poetry readings, bagpipe music and Highland dancing. 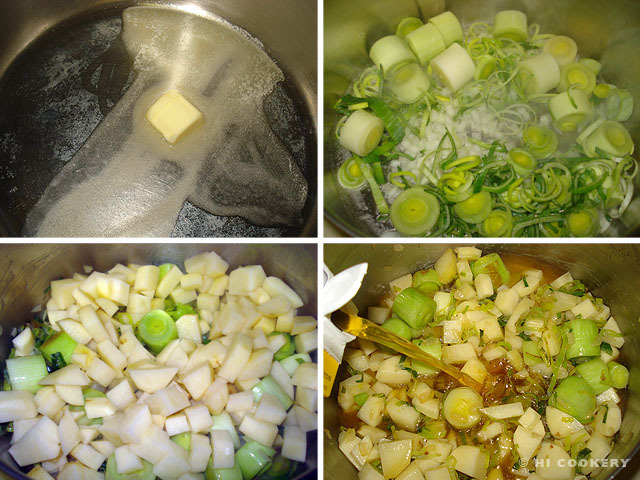 We like leek and tattie soup straight from the stock pot when we cook it at home. But sometimes we add milk and cream and puree everything in the blender to make a fancy French version of this soup called Vichyssoise. 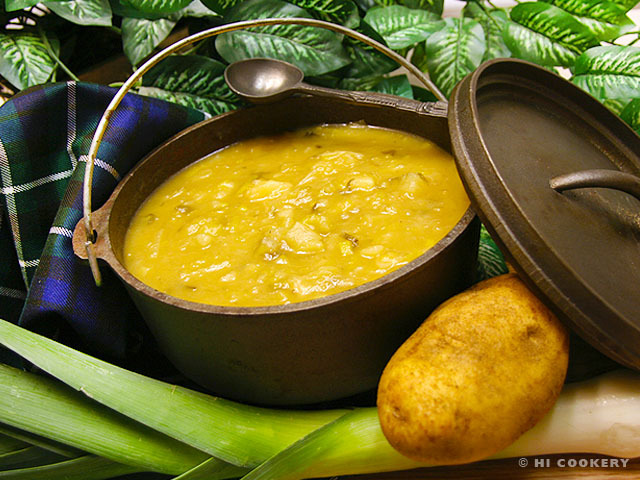 Savor the soup made with leeks and tatties during National Soup Month or on Burns Night on January 25. Chop the onions. Wash and slice the leeks, discarding the thread-like ends on the white part. Wash, peel and chop the potatoes. In a large pot, slowly melt 2 tablespoons of butter. Saute the onions and the leeks until soft (about 5 minutes) but do not brown. Stir in the potatoes and mix with the onions and leeks. Cook for about 2 minutes. Pour in the chicken or vegetable stock. Salt and pepper to taste. Cover the pot and simmer on medium heat for 30 minutes. Remove from heat and stir in the remaining 2 tablespoons of butter. Ladle into soup bowls and serve hot. Happy New Year and Hogmanay to our blog readers! Robert Burns wrote the traditional new year’s anthem “Auld Lang Syne”. Thanks to our neighbors across the street, Glenn and Anna Maria B., who are pioneer settlement re-enactors, for letting us borrow their rustic clad iron soup kettle as a prop for the final food photo. Search our blog for more Scottish and other soup recipes.